We all have that one specific food or snack item that doesn’t last more than a day in the kitchen. For my best friend, it’s cheddar Chex mix, but for me you need the Jaws of Life to pry a box of Entenmann’s cookies out of my hands. Actual footage of my childhood. Eventually we reach a point where these specific snacks are either banned completely-- “No, if I buy those I will eat the entire box”, and avoided like spotting an ex at the grocery store. Things don’t have to be so black and white. There are ways to enjoy a bag of chips, a couple cookies, bar of chocolate, etc. without going off the deep end. RD NOTE: If you currently struggle with a binge disorder then it is actually best to keep binge trigger foods out of the house until you begin to recover. Go to the dollar store and pick up a few packs of measuring utensils like tablespoons, teaspoons, etc. and cup ones as well (1/4 cup, ½ cup, etc.). 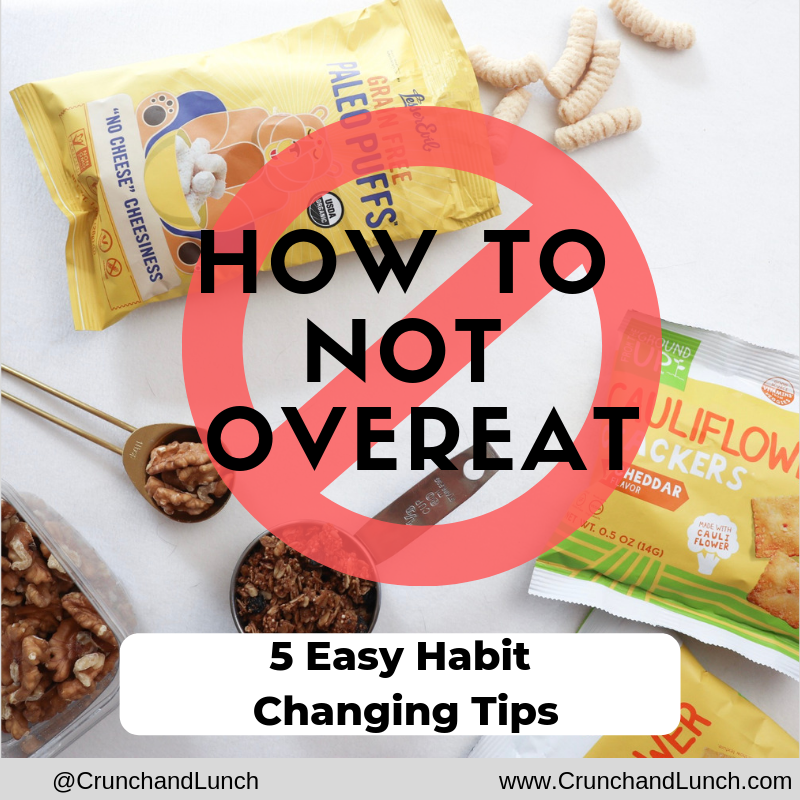 Leave the exact serving size measurer in your bag of granola, canister of nuts, jar of peanut butter, box of cereal, and anywhere else you normally guesstimate the serving size. For example, if you look at the nutritional facts on your bag of granola and it reads the serving size is ¼ cup then toss a ¼ cup measurer in the bag so that you know that scoop is fulfilling your one serving. It is way easier to overeat and accumulate unnecessary calories when you serve yourself freely. Another great example would be to leave a tablespoon measurer in your nut butter. It is super easy to go over on peanut butter. The photo above shows mini bags of some of my favorite snacks like Paleo Puffs and Cauliflower Crackers. I actually bought a big box of the individual cauliflower crackers at Harmon for a fantastic price, but sometimes snack sized option can be more expensive. If you are looking to save money I recommend getting some ziplocks (preferably reusable ones like THESE or you can keep reusing your plastic ones) and fill them up with a serving of the snack you are portioning out. Ok this one is always a hit or miss with my clients. Personally, I cannot stand frozen chocolate, cold brownies, or icy muffins. When I break off a piece of chocolate I toss the rest in the freezer, because I know the frozen version wont appeal to me. I do this with all sweets and baked goods that serve as temptations on the counter or in the fridge. Turn over a bag of nuts or a block of cheese and you will likely see the serving size listed in grams or ounces. What a hassle trying to decipher an ounce or gram of anything! Take away the stress by picking up a food scale and weighing these items out. I use the scale as more of a training tool because after measuring out your favorite snacks for a few weeks you will eventually be able to put the scale away and correctly eye ball a serving. Portion distortion is REAL in the US, so by practicing at home you are way less likely to overeat at restaurants when you have no control over the amount they give you. It’s going to sound weird, but if I ever see something at the grocery store and say “wow I can really go for that” I purposely do NOT get it. I opt for something else that will satisfy my craving but was not what my eyes were fixated on. Last week I really wanted a piece of Hu Chocolate. As I perused my options at Whole Foods, I saw the salted dark chocolate bar. It was practically calling my name. I knew that because I wanted that specific bar I would end up pleasing my taste buds to the extreme and end up eating the entire thing. They have another flavor with banana chips inside, I like it, but its not was I was in the mood for. Nonetheless I purchased the banana bar left the store and cracked off two pieces to eat. Not only did this satisfy my chocolate craving, but I totally forgot about the salted chocolate bar and I did not feel compelled to eat the whole thing.